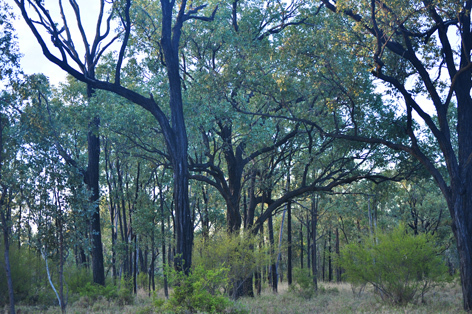 The Silver leaf ironbark is just one of the flora species found at Bimblebox Nature Refuge, near Alpha, Central Queensland, desert uplands bio-region. From the Myrtaceae family this evergreen tree forms a canopy of approximately 12-18m. It is usually found on uniform sandy soils and can be recognised by its white flowers, blue-grey leaves and grey-black furrowed bark and stems. This species is usually also found to co-dominate with ‘Eucalyptus populnea’ (commonly known as Poplar box or Bimble box). The Silver leaf ironbark woodlands supports a rich understory of floristic biodiversity and provides valuable habitat for local fauna. Unfortunately however, this vegetation community is currently list as “of concern” under the Vegetation Management Act (1999), Queensland.